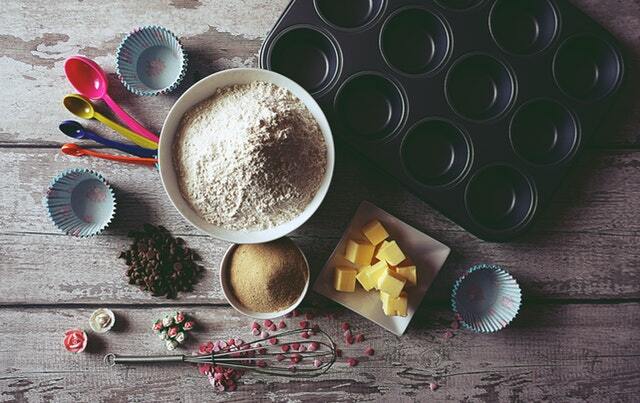 If you love to cook and bake, it is hard to beat a good stand mixer. With a price tag ranging from around $150 to upwards of $2000, however, such a purchase is really more of an investment, isn’t it? With several college culinary courses under my belt and a Christmas bonus check in my pocket, I set off to buy the mixer of my dreams. 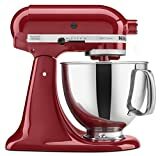 I had my heart set on a stand mixer, but which one? I was aware there were several good brands out there. Deciding to do some research before I made that big purchase, I began by reading some in-depth product reviews of stand mixers. I had to think about what I really needed. Take into account how much you will be using it and for what purpose. Also, consider if you will have enough counter space for such an item. I decided that the mixer I chose must meet certain standards. For instance, it had to be sturdy and have a strong motor. It should be built well enough to last through a lifetime of whipping potatoes, kneading dough, beating cake batter, and still survive the making of divinity. As anyone who has ever made divinity can attest, it will test the metal of any mixer. The best stand mixer must be easy to clean and be a good value. That’s an awful lot to ask from a mere kitchen appliance. I do a great deal of research on nearly everything I buy. With that said, I did my homework on this purchase as well. That’s how I came to decide upon the functionally beautiful KitchenAid Artisan Series stand mixer. It faced some good competition, but it has proven to be a worthwhile addition to my kitchen. There is something about a KitchenAid mixer that makes me a little nostalgic. I always think of my Great-Grandma Rhode’s sugar cookies. Counters covered with bowls of dough, flour scattered about and the warm, wonderful fragrance of sugar cookies wafts throughout the house. In the midst of it all, a KitchenAid stand mixer. Of course, my Grandma Rhode just thought of her KitchenAid mixer simply as a workhorse – and rightly so. However, today, the KitchenAid stand mixer is not just a workhorse in the kitchen. It’s also a “show horse” as well. The Artisan Series is available in 47 amazing colors. From the deep, rich matte black violet to the stunning copper pearl, KitchenAid offers an insane range of colors. It is easily one of the most beautiful additions I’ve made to my kitchen. The list of colors is almond cream, apple cider, aqua sky, buttercup, imperial black, black matte, blue steel, cobalt blue, matte black violet, blue willow, Bordeaux, boysenberry, cranberry, copper pearl, crystal blue, contour silver, caviar, and empire red. Then, there is espresso, matte gray, matte white, green apple, gloss cinnamon, grenadine, imperial grey, guava glaze, ink blue, ice, lavender cream, metallic chrome, matte milkshake, medallion silver, persimmon, pistachio, graphite, silver metallic, twilight blue, truffle dust, tangerine, white, and watermelon. These stand mixers are not small, nor are they light. You’ll want to clear off space on your countertop where it can live out its days. These machines weigh in at 23 pounds and have a considerable footprint that measures approximately 14 x 9 x 13 inches. You’re probably not going to want to move this beast around much. With this kind of heft, I’ve found that even beating the stiffest batter at high speed won’t make this thing budge. This particular model has a 10-speed, 375-watt motor and comes with a flat beater that you’ll find yourself using on most applications such as mixing cookie dough and beating cake batter. It also comes with a dough hook for kneading bread and a wire whip that is great when it comes to aerating whipping cream or a very light batter. To help with adding ingredients to your batter while the machine is in motion, they’ve added a pouring shield. Honestly, I don’t really use my pouring shield as much as I probably should. It comes in two pieces. I just find it easier to stop the action, lift the motor head and add in the ingredients that way. However, I have found that it helps to keep ingredients in the bowl where they belong when you’re mixing. Regardless of what you’re making, the beater and hook are both coated and dishwasher friendly, so I have found that cleaning up is really easy. My Artisan stand mixer came with a stainless steel bowl with a “comfort handle”. However, you can get the glass bowl with a pour-spout option. Both are dishwasher friendly as well. Speaking of beaters, KitchenAid stand mixers boast a 59-point planetary mixing action, ultimately striking 59 points in a stationary bowl during rotation, ensuring even and thorough incorporation of the ingredients. Have you ever wondered what that little round thing on the front of any of the KitchenAid stand mixers is called? It’s a power hub. With this hub, you can access a number of really cool gadgets. For instance, my family likes it when I make homemade pasta. So, of course, my favorite tool is the pasta cutter. 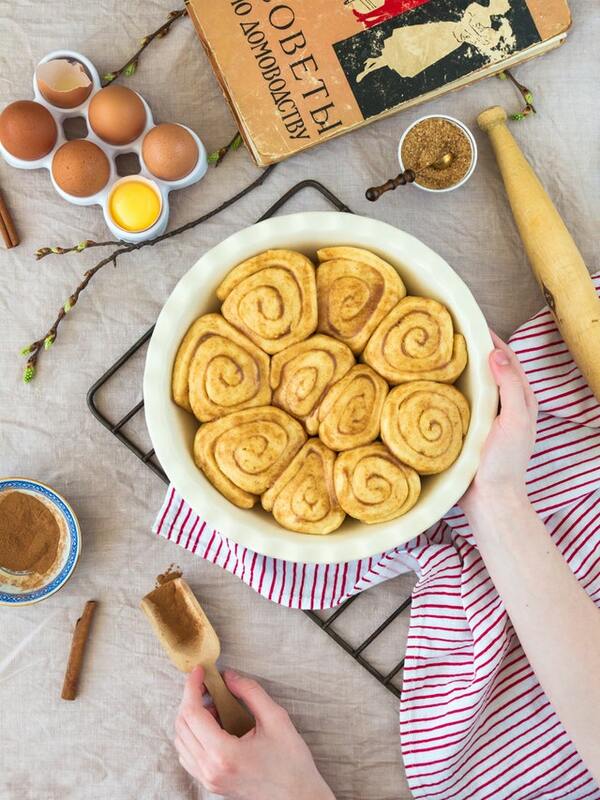 It’s easy to use and makes time in the kitchen much more enjoyable. Although, we recently had to grind up several pounds of not so tender beef into burger using the slicer/shredder + grinder/sausage stuffer attachment. It was not a bad experience. It made me appreciate this stand mixer all the more. There are eight other attachments that you can buy for the Artisan, including an ice cream maker, and a grain mill. I have limited space in my small kitchen, so I really like that KitchenAid has all of these space-saving attachments available. These were definitely on my wish list. 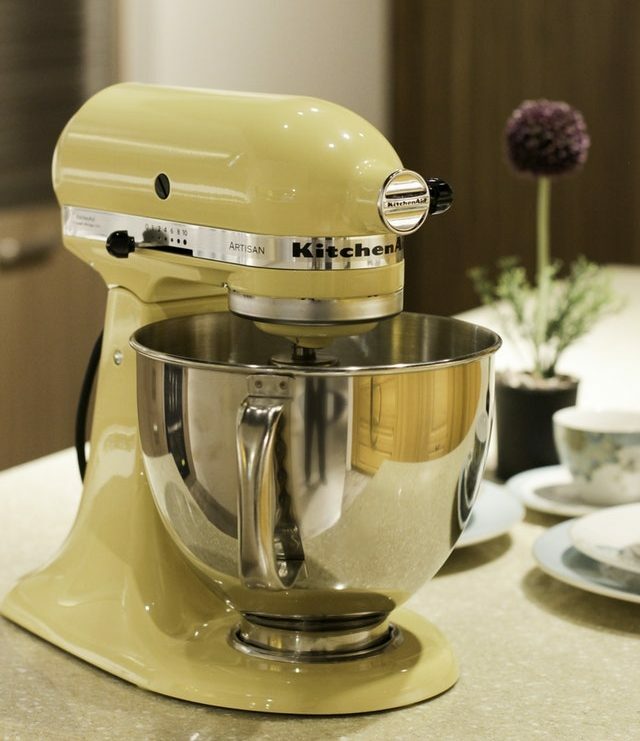 KitchenAid offers a two-year full warranty. During that period, customers have a choice of their mixer repaired or replaced. A big factor in my choosing a KitchenAid stand mixer over any other brand was that while the other mixers were certainly worthy of consideration, there is something about KitchenAid’s heritage and history. In 2019, KitchenAid celebrates their 100th birthday by producing a special limited-edition stand mixer. Not only that, KitchenAid stand mixers are still designed and assembled at their factory in Greenville, Ohio. While definitely not a deal breaker, I would prefer a different design on the pouring shield. The two pieces look like they should latch securely. However, usually one of the two pieces slip, causing the other piece to fall into the batter. When it works, it’s great. But when it doesn’t, it can be a source of frustration. Cuisinart conjures up not so much nostalgia for me, as it does shining, gleaming state of the art culinary equipment gracing the counters of celebrity chefs. When I hear the word Cuisinart, I always think of quality kitchen products. In fact, I am the proud owner of a few pieces of Cuisinart equipment. One of the first things I look for in a stand mixer is the weight of the machine. My theory is that you don’t want it “walking” all over the counter when you’re beating something at high speeds. This machine weighs in at 17 pounds. At approximately 14” x 8” x 14”, it has a slightly smaller footprint than the KitchenAid mixer and, according to reviewers, remains stable during operation. Like the KitchenAid, this mixer is made of heavy die-cast metal construction. 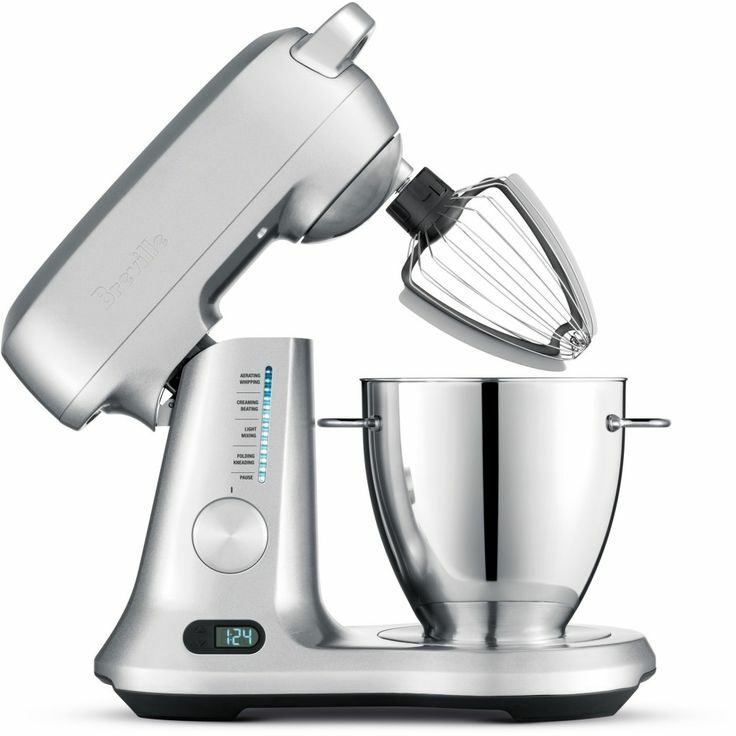 It has a 12-speed 500-watt motor and comes with a chef’s whisk, dough hook, a flat mixing paddle, and a splash guard with a pour spout. There are also optional attachments you can purchase such as a meat grinder, pasta extruder, pasta rollers & cutters, and ice cream maker. This sleek beauty is available in six colors: silver lining, onyx, periwinkle blue, ruby red, white linen, and robin’s egg. 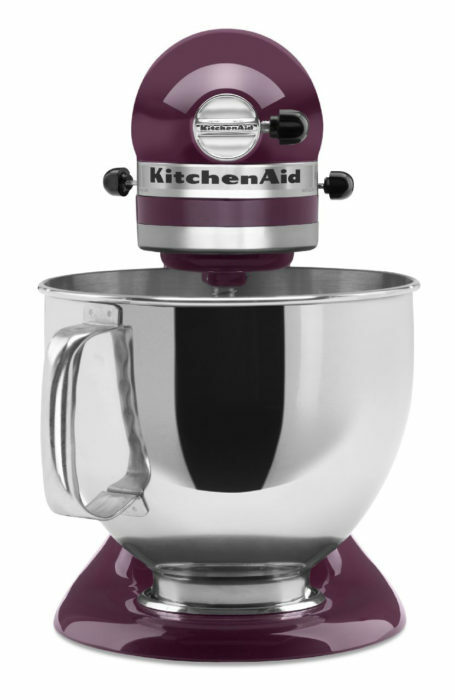 While it is a beautifully designed machine, and the reviews are positive, I still felt drawn to the KitchenAid. Maybe it was their incredible selection of colors or the nostalgia associated with the brand. However, I think the fact that it is still built in America and that the features I tend to use most work well that probably played the biggest part in my choosing the KitchenAid stand mixer over the Cuisinart. Cuisinart also offers a limited 3-year warranty, essentially ensuring that this stand mixer “will be free of defects in materials and workmanship under normal home use”. Were it not for the sentiment I attach to the KitchenAid, and products being made, at least partially, in America, this stand mixer probably would be sitting on my counter now. Additionally, it does offer a longer warranty than that of the KitchenAid. Cuisinart does have a reputation for not having the best customer service but you hopefully won’t have to ever use them. The Breville BEM800XL is a sleek design that would certainly be an attribute to any kitchen. It has a slightly smaller footprint than the Cuisinart or KitchenAid. Even though it weighs somewhat less, it maintains stable footing while operating at high speeds. Being able to store your cord in its internal storage compartment helps to keep your counters uncluttered and is definitely a plus. It has a 12-speed illuminated LED electronic speed dial that controls the 550-watt motor. While it’s slightly less expensive than either the Cuisinart or KitchenAid mixers, it offers some unique and desirable features. For instance, it comes with a scraper beater. If you’re like me, you may be wondering exactly what that is. 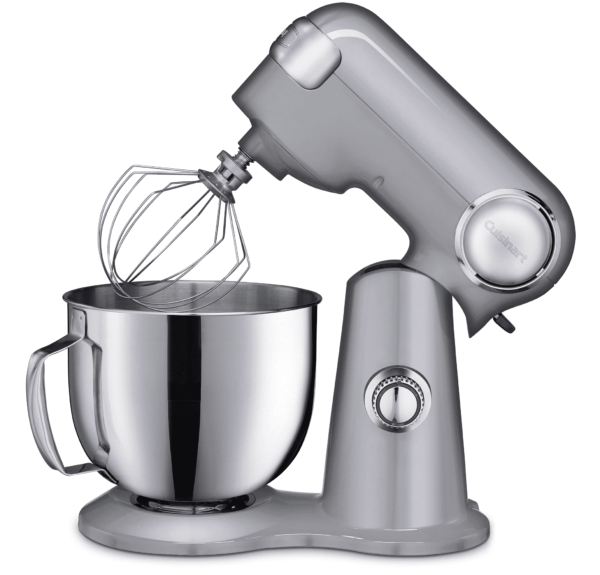 In addition to the typical flat beater, dough hook, wire whip, and two-piece pour shield, this stand mixer also comes with a flat beater that has rubber scrapers down either side and around the bottom. The scraper beater is particularly handy when you want to make sure that the cake mix is completely incorporated into the batter. This saves you from having to use a spatula to manually clean the sides and the bottom of the bowl. It also has a timer that both “counts-up” and “counts-down”. This is handy if you want to record the time it takes to mix all of the ingredients thoroughly. Another feature is the safety switch that automatically shuts the mixer off if it senses that the motor head is being lifted while in operation. In order to keep the motor from burning up under heavy load, it has a safety shut off that senses an overload. Many higher-end stand mixers come with this feature. One of the things I really like about the Breville is the handle on the front of the machine that you can use to tilt the head back. While it’s certainly not difficult to tilt the mixing head on the Cuisinart or KitchenAid, the handle just gives you better leverage and makes it easier. That said, that handle is located where both the Cuisinart and KitchenAid have installed their power hub. If accessories are important to you, you should know the Breville is not set up to operate them. What the Breville does have, though, is load-sensing technology. This feature detects when a heavy batter is being mixed and will adjust its speed accordingly. Breville is an Australian company, though I was never able to pin down exactly where their stand mixers are made. They do offer a 1-year repair and 5-year motor warranty. While I think the Breville is a lovely stand mixer, and it has positive reviews across the board, there were a couple of things that I wasn’t particularly crazy about. For instance, the automatic shut off that occurs when you lift the motor head during operation. I like to lift the beaters slightly out of the batter at the slowest speed when I’m done mixing my batter. It generally helps to clear any hanging batter off of the beater. Also, it doesn’t offer any attachment options, like the pasta maker. That’s another option, that I would like to have available to me if I should decide I need it. Finally, both the KitchenAid and Cuisinart offer a variety of colors. My own stand mixer is a neutral color so it will always fit in with my kitchen regardless of what colors are in my kitchen. Again, it is not a deal breaker, I just like to have options. It’s really exciting to purchase a shiny new stand mixer. When you walk into a department store or browse the web pages looking for that perfect machine, it’s easy to get carried away with appearances. A good, well-built stand mixer, however, can be expected to provide years of service. Therefore, I like to stick with the basic functional machine and shy away from all those bells and whistles. That’s just fewer things that can go wrong with it, or become outdated. I chose the Kitchenaid Artisan and I’ve never looked back. I’ve made homemade pizza crust, whipped lots of cream, pasta, and dozens of cookies and cakes. I’m certain I’ll be able to pass this stand mixer on to my son many years down the road. What are the different accessories used for? All of these stand mixers come with a flat beater. You’ll probably find yourself using this beater the most since it is used for mixing, creaming, and combining ingredients. The dough hook comes with these stand mixers as well. As the name denotes, you’ll use it when mixing and kneading pizza and bread dough. It’s designed to be used on low speeds. Both the flat beater and dough hook are dishwasher-safe. Finally, the wire whisk is handy for light mixtures like whipping meringues, whipping cream, and angel food batter. The wire whisk needs to be hand-washed. What should I look for in terms of power? There are some things I’ve learned while researching stand mixers. First, do you know how the descriptions always highlight the wattage as it should really mean something in terms of power? It turns out that watts don’t really mean anything. Actually, the power on commercial stand mixers is referred to in horsepower. However, with no real way to measure horsepower on a consumer style stand mixer, the manufacturers choose to refer to the watts. Even more important than wattage is the build quality of the mixer, the efficiency of the motor, and whether the gears that are turning the beaters are made of high-quality materials. Ultimately, a quality stand mixer that has a lower wattage performs better than a cheaply built machine with high wattage. What’s the difference between a tilt-head and a bowl-lift stand mixer? I’ve used bowl-lift stand mixers while in culinary school and they are considerably more bulky than tilt-head mixers. The larger frame absorbs the inertia and is more stable when mixing the heavy dough. You’re more likely to find these in small bakeries and commercial kitchens. The tilt-head is what you commonly find in smaller kitchens. You simply tilt the motor head back to change out the accessories and fasten the bowl into the bottom. They are shorter and take up less room than the bowl-lift. This entry was posted in In Depth Product Reviews and tagged Artisan, Breville, Breville BEM800XL, cuisinart, Cuisinart SM-50BC, KitchenAid, KitchenAid Artisan, KitchenAide Stand Mixer, Stand Mixer, Stand Mixer Comparison, Stand Mixers. Bookmark the permalink.